2017 has been the year of the "to-do list" for me. The agenda of new restaurants I've been meaning to try continues to grow, and unlike the past several years, the usual forces of attrition (i.e., closures) haven't whittled it down quite as much as usual. Making it even more challenging, those openings haven't been limited to the ever-popular trifecta of Wynwood, South Beach and Brickell. It's good news for the residents of the outer bands of Greater Miami; it's a challenge for those trying to keep up with all the latest additions. Witness, for example, No Name Chinese, which opened late this spring in South Miami, on a quiet corner behind the Shops at Sunset Place. 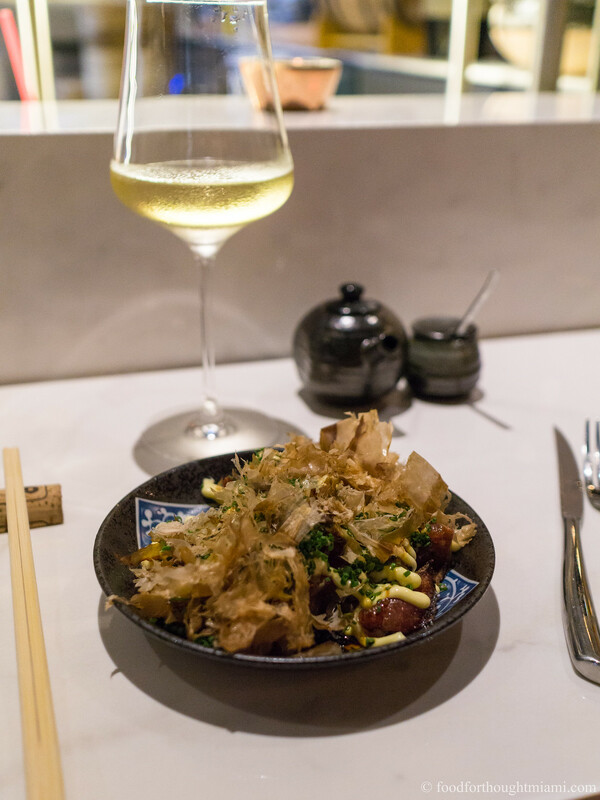 No Name is the second spot from the team of wine buff Heath Porter and manager Craig DeWald (their first is Uvaggio wine bar in Coral Gables), who decided they wanted to open a place serving contemporary Chinese cuisine using local ingredients paired with unusual wines. 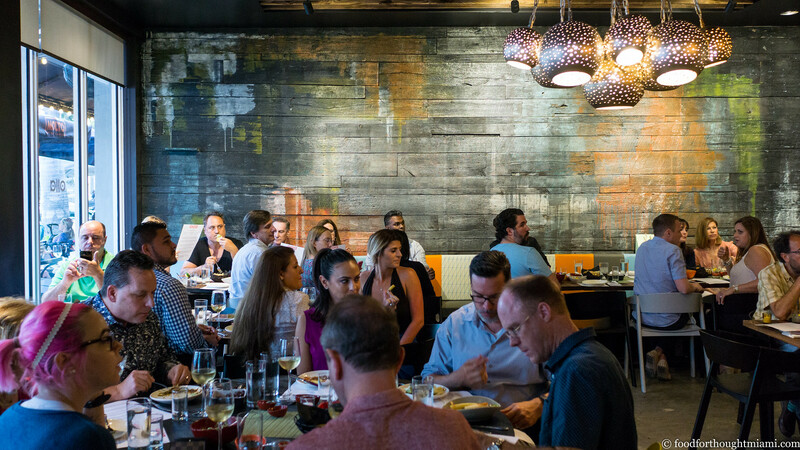 They brought in Pablo Zitzmann to run the kitchen, who was last seen at the now-closed Trust & Co. in the Gables, and before that worked with Jean-Georges Vongerichten and Jeremy Ford at Matador Room, Ricky Sauri at Nobu and then Bloom in Wynwood, and Michelle Bernstein at Sra. Martinez, among others. 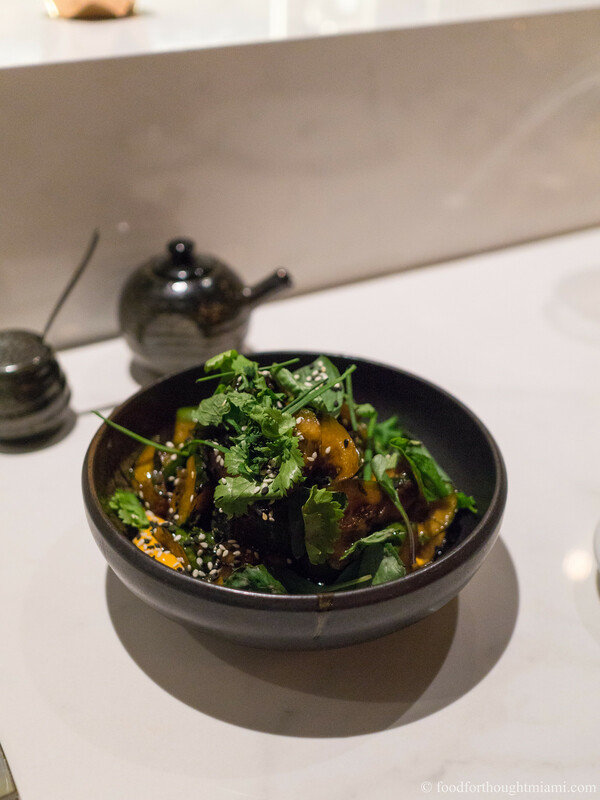 Zitmann's menu at No Name is inspired by traditional Chinese dishes and flavors, but takes plenty of liberties. So there's a crispy turnip cake (law bok gow), a Chinese dim sum standard, but it's done in the style of a Japanese okonomiyaki topped with lap cheong sausage, shiitake mushrooms, Kewpie mayo and katsuobushi, the shavings of smoked, dried skipjack tuna wriggling in the heat. 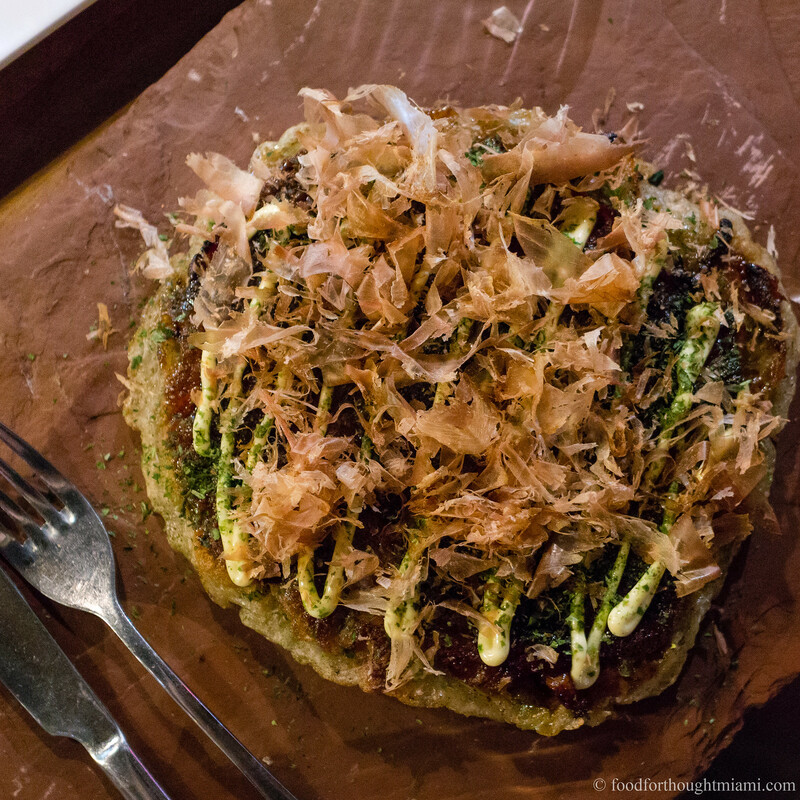 Turnip cake and okonomiyaki are a couple of my favorite things, so this makes me very happy. 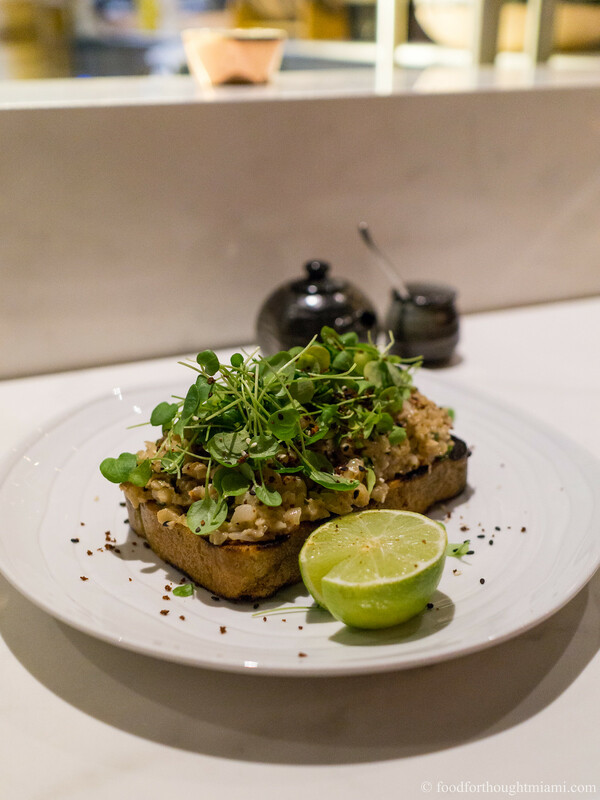 Shrimp toast, usually a greasy fried indulgence, here comes on as healthy-ish as avocado toast: house-made shao bing bread topped with a clean, bright minced shrimp salad, its flavors amplified with a squeeze of lime and a dusting of "crunchy garlic bomb." Smashed cucumber salad, another Chinese staple which everyone is riffing on lately, sees the cukes marinated in soy sauce and chianking vinegar, then plated over a creamy sesame sauce and topped with a shower of sesame seeds and a bouquet of fresh herbs. It's the kind of thing you keep going back for more bites of as you eat the rest of your meal. 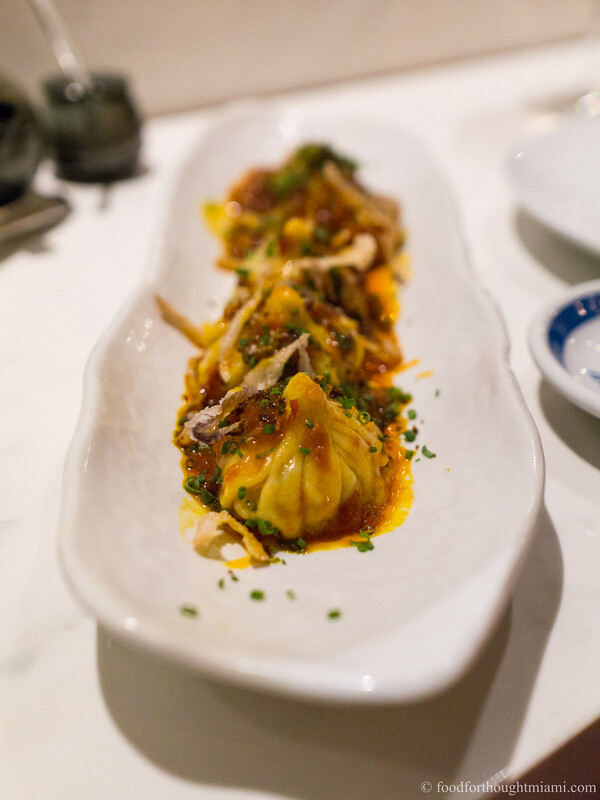 There's an abbreviated selection of about a half-dozen dumplings – not quite enough to start supplying a fleet of carts, but enough to satisfy some dim sum cravings. 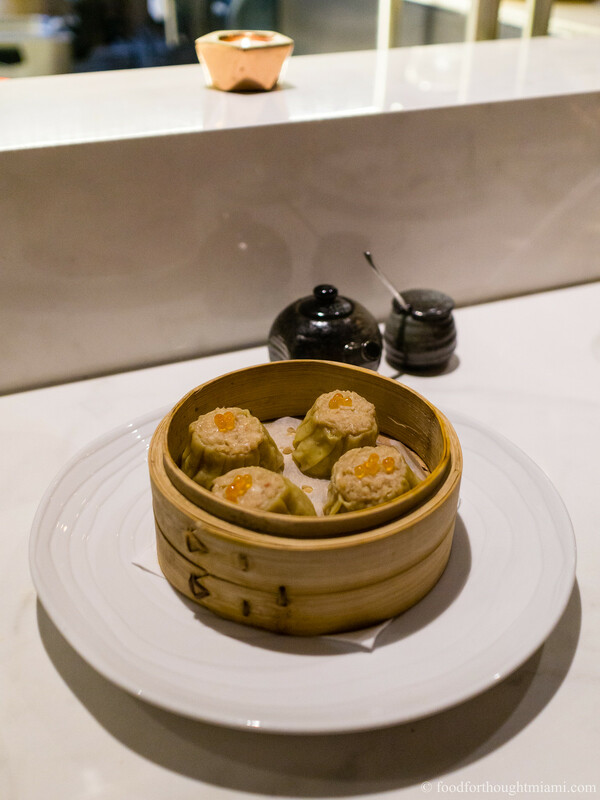 No Name's shu mai are nearly bursting with a juicy paste of Key West pink shrimp and crab, topped with trout roe for a little pop and contrast. The "angry dumplings" are filled with spicy minced chicken, and dressed with a zippy chili garlic sauce, crispy shallots, more of that "crunchy garlic bomb," and a last minute dusting of orange zest to perk up all those flavors. Summer in South Florida isn't good for much. Mangoes. Avocados. Royal poincianas. That's about it. It's the season of 90° heat with 90% humidity, hurricanes, and restaurant closures. But we've made it through to the other side! The thermometer occasionally dips below 80°, most of the trees downed by Hurricane Irma have been cleared, and new restaurants are popping up left and right. Among them is Stubborn Seed, which opened in late September. 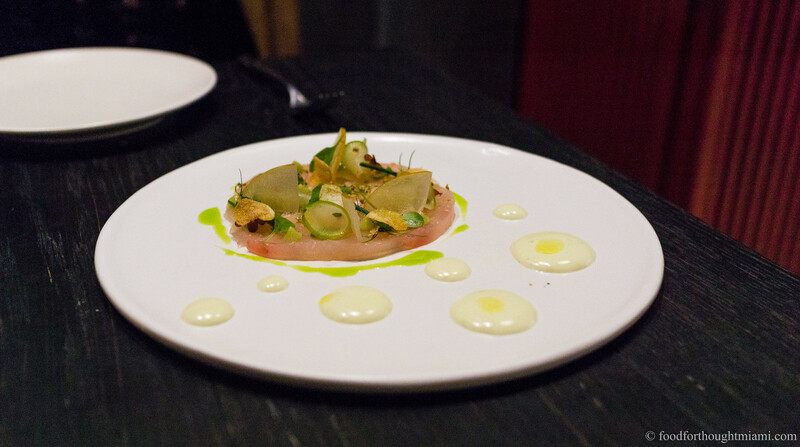 It is the first of two new projects from chef Jeremy Ford, who was last heading up the kitchen at Jean-Georges Vongerichten's Matador Room, though many more folks probably know him from his victory in Top Chef Season 13. This is a much more intimate affair than his last gig. Ford has traded a big hotel restaurant for a corner spot in South Beach's quieter SoFi (South of Fifth) neighborhood, where about sixty seats are divided between a bar area with high-tops as you enter and a somewhat stark dining room in back, all buffed gray walls and dark wood tables. The menu at Stubborn Seed is somewhat stark as well: it comprises fifteen items all told, which includes a "bread service" that was brought to our table without charge. It's matched by a cocktail selection that is nearly the same size – in fact, the actual drinks menu is in the form of a newspaper which dwarfs the size of the food menu. The bread service and the cocktails are a good way to start things off at Stubborn Seed. 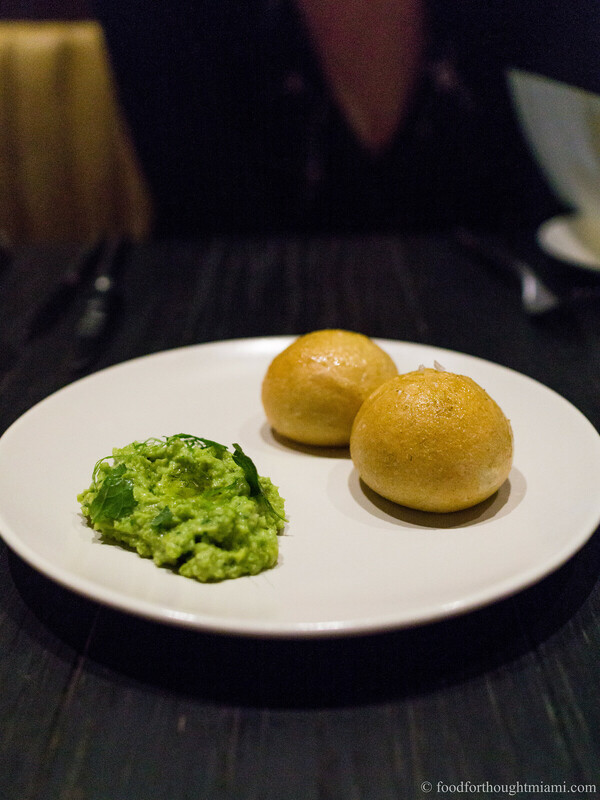 The bread is a puffy version of Colombian pan de bono, dusted with fennel pollen and coarse salt, and served with a dollop of an herb-flecked green garbanzo dip whose bright color matches its flavor. And you'll want to spend some time with these cocktails, because they're a production. 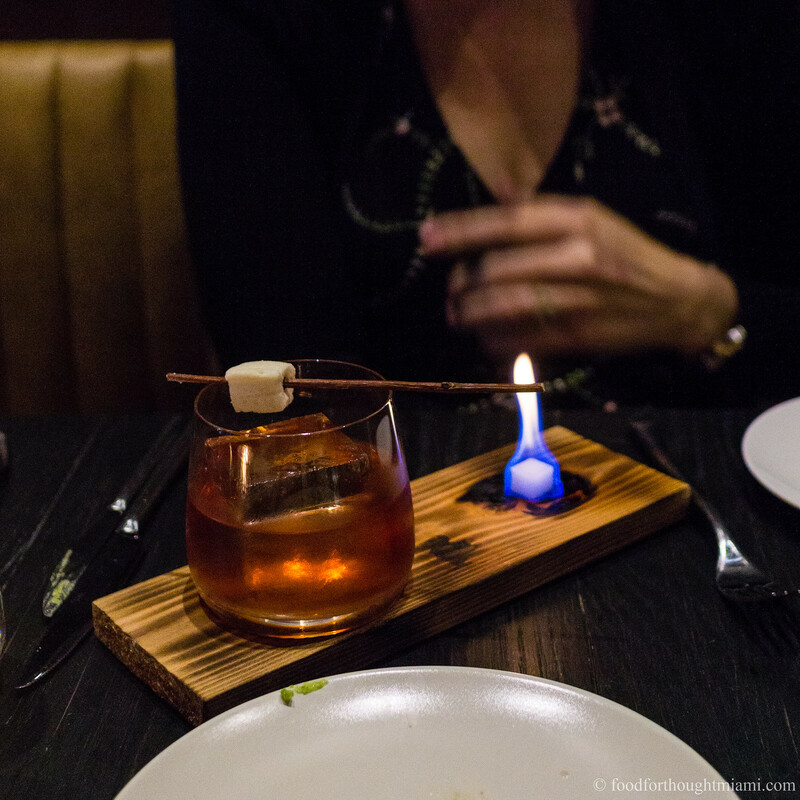 The "Negroni a la Ford" is made with Del Maguey Vida Mezcal in place of the gin, plus Ancho Reyes, white creme de cacao, and Xocolatl Mole bitters, as well as a passionfruit marshmallow suspended across the glass which you can toast over a flaming sugar cube. The "Silver Dollar Old Fashioned" is a D.I.Y. project which literally arrives on a silver platter, with a cut-glass decanter of rye, a dropper of house-made bitters, a shaker of simple syrup, and a big ice block in a glass. There's a lot of ungapatchka here, but you could skip the s'mores and the silver platters and they'd still be very good drinks. It's possible you've heard this before, but dishes "are meant to be shared," and "come out of the kitchen as they're ready." We ordered several of the crudos and "snacks" (which collectively make up 2/3 of the short menu) and one larger dish to share; happily, rather than the confused multi-plate pile-up that often ensues, our meal was coursed out in a series of rounds that actually made sense. But pity the diner who just wants their own appetizer followed by an entree these days. When Ford was on Top Chef, I nicknamed him "Crudo Bro," because every dish he made was a crudo, and because he is clearly a member of the Broheim Tribe. So we had to try both iterations featured on the menu. The one pictured at top was a winner: meaty, fatty Hawaiian kajiki (blue marlin), paired with creamy buttermilk and spicy fermented chiles, kombu, ribbons of Asian pear, and dried sea grapes. It was great. 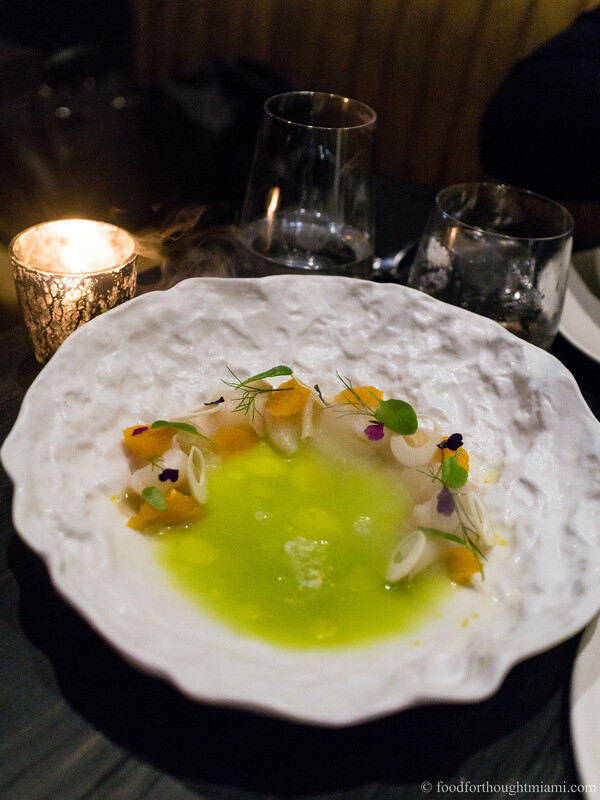 The other, featuring local snapper cured in JoJo tea, with slivers of heart of palm and clementine segments, awash in a green bath of sorrel and celery, was dominated by the cloying sweetness of the clementine. This dish needs something to perk it up other than the smoke from dry ice added to the bowl. This lavash cracker, spread with chicken liver mousse and dotted with smoked chili jam, was just delicious – crunchy, creamy, rich, spicy, sweet. Shared between two people, it makes for only a couple bites, and may well leave you pining for another. There's a phenomenon on social media lately that whenever a celebrity chef expresses an opinion on political or social issues, a chorus of those whose sensibilities diverge insist that the chef should "stay in their lane." In other words, talk about food all you want, but keep your politics to yourself. The reaction seems inherently ridiculous to me – if you don't like it, the "unfollow" button is a simple, elegant solution – and hypocritical. Unless, that is, all these "stay in your lane" folks are actually career political scientists themselves, or perhaps professional life coaches. I bring this up here because Chef José Andrés is a powerful retort to that kind of nonsense, someone whose talk has been backed up by meaningful, thoughtful action. The day after Hurricane Harvey cleared Texas, he was in Houston feeding people. A month later when Hurricane Maria decimated Puerto Rico, he was there within days serving meals. Over the past weeks, he's mobilized a brigade of food trucks and canteen kitchens to serve 100,000 meals a day, while getting minimal support from the federal government, in a territory with an almost entirely broken infrastructure. All of which is to say: José Andrés can cruise in any lane he wants, as far as I'm concerned. While the work he's doing now in Puerto Rico is infinitely more important, those lanes do actually include chef and restaurateur as well. 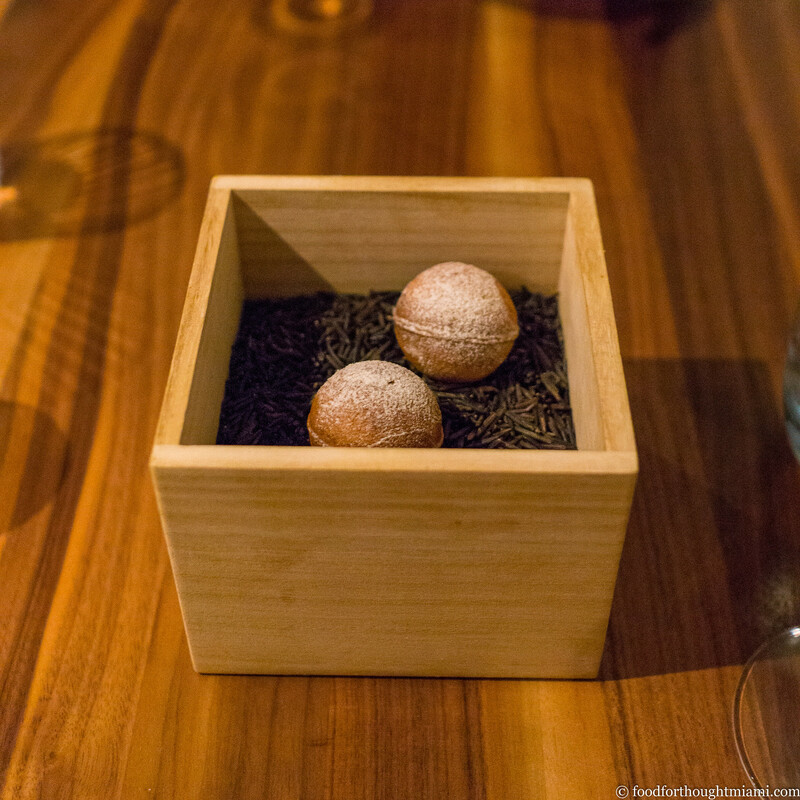 Andrés' restaurants include the Michelin two-star Minibar, along with a mini-empire of places in DC, LA, Miami, and Las Vegas, the last of which I visited recently for a conference. While there, I squeezed in a dinner at é by José Andrés, an 8-seat "restaurant within a restaurant" inside Jaleo at the Cosmopolitan. (You can see all my pictures in this é by José Andrés - Las Vegas flickr set). 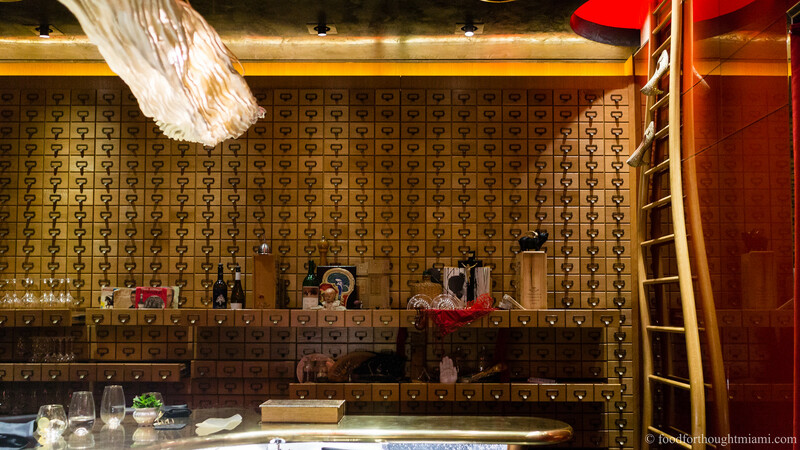 The format of é is patterned after the original iteration of Minibar in DC with a dollop of Vegas glitz. 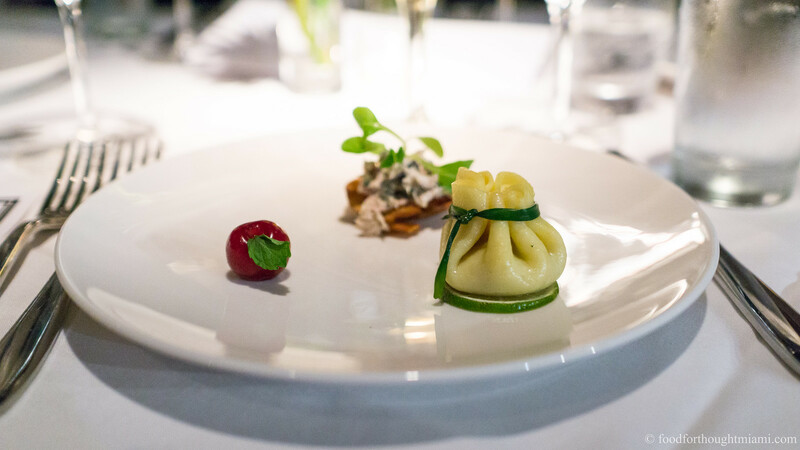 Its roughly 20-course tasting menu is unabashedly inspired by the creations of Andrés' mentor, Ferran Adrià, with whom Andrés worked at El Bulli in Spain before going on to tremendous success in the U.S. I'd visited é once before, though I hadn't realized how long ago it had been – nearly six years. The room, centered by a polished metal chef's counter surrounded by walls lined with tiny drawers and odd tchotchkes, hasn't changed much. 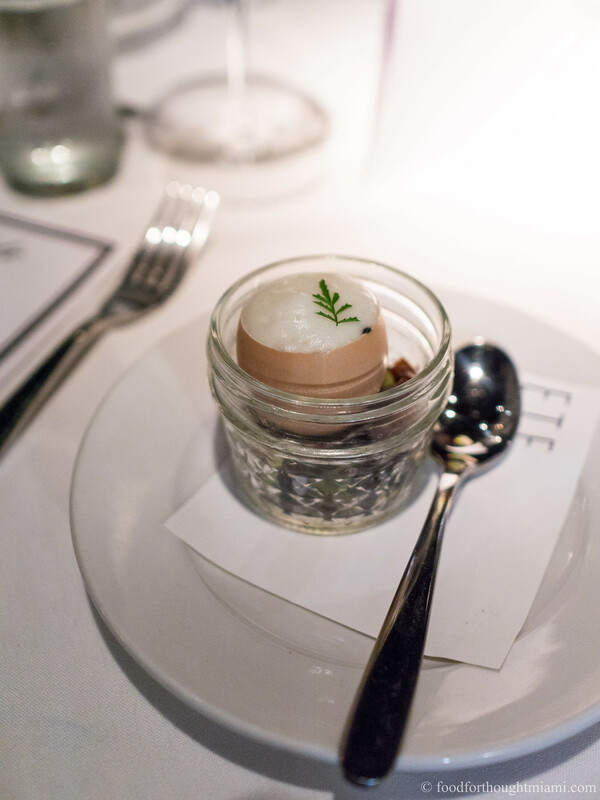 One of the chefs said it was meant to make you feel like "You're inside Chef Andrés' head." (It kind of does.) The menu was almost entirely different, though there were some echoes of prior meals. 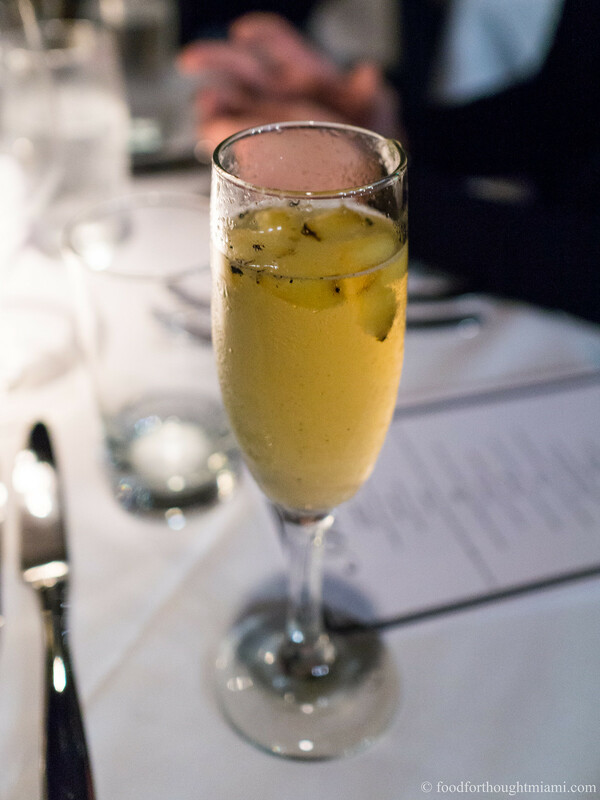 Guests are corralled at a table in Jaleo and offered a drink before the dinner at é starts. 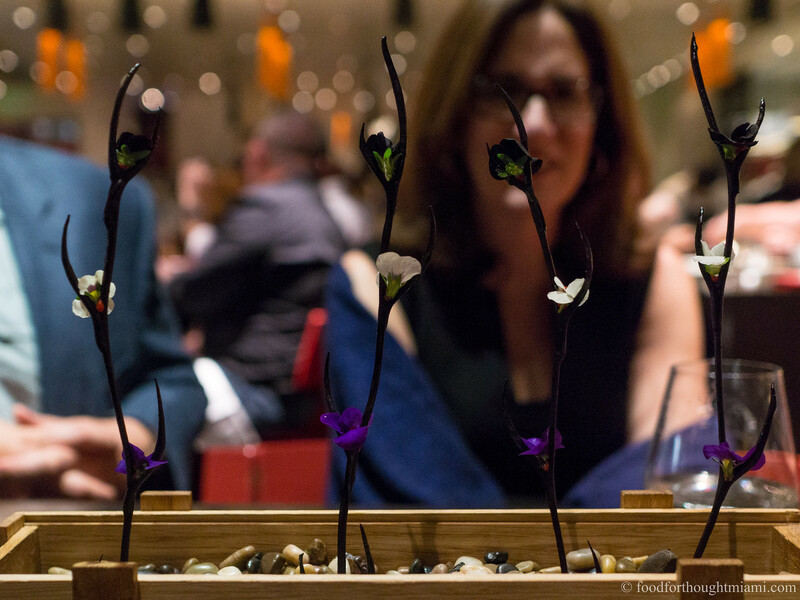 After a few minutes, the hostess divulges that the centerpiece on the table is also the first course: a cracker flavored with black olive, stuck with edible flowers. 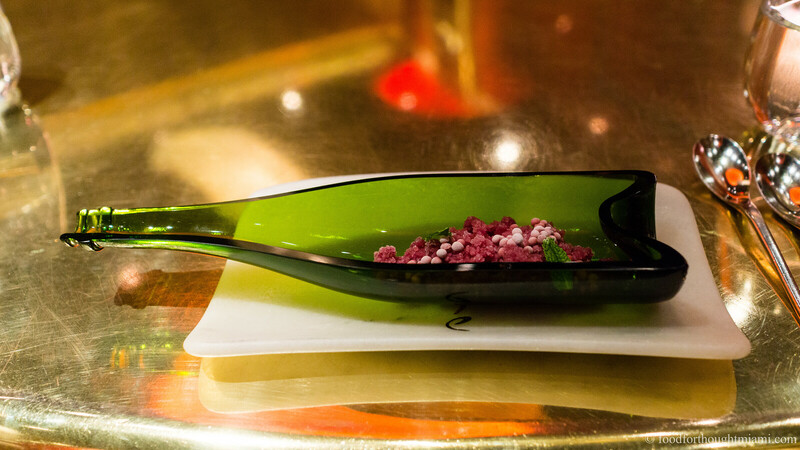 Then upon entering the cloistered dining room, a cocktail: sangria, frozen and powdered to a slushie-like consistency, with compressed melon, sour cherry pearls, and fresh mint leaves. 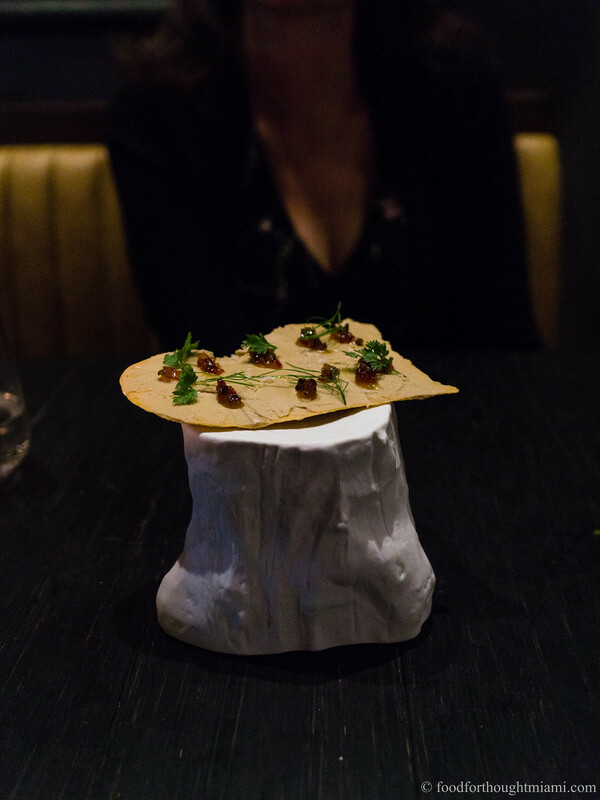 A cheese course of sorts: a soft-frozen manchego and beet rose topping a walnut cracker, "stones" of idiazabal cheese with a jamón and rosemary glaze nestled atop a bowl of river stones; and a "pizza" of San Simon cheese topped with oregano cream, dried tomato, and fresh shaved truffle. 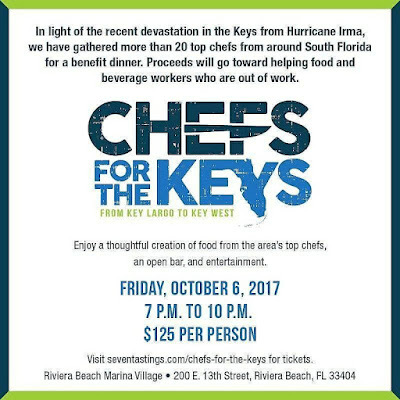 A lineup of more than two dozen Palm Beach chefs will be participating in this event, with all of the proceeds of the $125 per person admission going to benefit Florida Keys food and beverage hospitality industry workers who have been out of work as a result of Hurricane Irma (use the link above to get tickets). 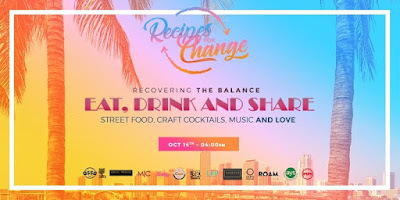 Next weekend, chef Santiago Gomez will host an international brigade of chefs at Casa Florida in the Roam Miami (a/k/a the Miami River Inn), including Carlos Garcia of Venezuela's Alto, and also opening Obra Kitchen in Miami; Sebastian La Rocca from El Mangroove in Costa Rica; Mirciny Moliviatis of Guatemala; Xavier Torres of Miami's Drunken Dragon, and Renzo Garibaldi of Peru's Osso Carniceria. $25 will get you 6 bites, $50 for unlimited bites and a drink, with 100% of the moneys collected going to the families of local farmers affected by Hurricane Irma (use the link to get tickets). Or, you can make a contribution to World Central Kitchen, an organization spearheaded by Chef José Andrés, which was on the ground in Puerto Rico two days after Hurricane Maria, and has already delivered over 100,000 meals and plans to deliver another 20,000 meals a day for the next several weeks. You can read more about what they're doing here. It's absolutely remarkable and vital work. Maybe consider matching what you'll spend on a dinner this weekend with a contribution to help feed those in need. A couple years ago I got pretty excited over a tiny storefront along Biscayne Boulevard serving possibly the best Thai food I'd eaten in South Florida: Cake Thai Kitchen. Since then, Chef Cake (a/k/a Phuket Thongsodchareondee) has gone on to open a second, more polished Cake Thai in Wynwood, and has plans in the works for another location in the Citadel, a food hall and multi-purpose space currently in development in Little Haiti. It's been wonderful to watch the ascent of a chef whose talent is matched only by his humility. And now, he's doing something else: a Japanese style izakaya in the Midtown Miami space of "The Gang," which he's calling "Gaijin Izakaya by Cake." It's called "Gaijin" to dispel any notions of authenticity and because, well, Cake is as Japanese as I am, but it's really not such a huge leap: before opening his own Thai restaurant, Cake worked for years with chef Makoto Okuwa at Makoto in Bal Harbour, one of the best Japanese restaurants in town. His menu at Gaijin is long and ambitious (I've not seen it posted online yet but I've got pictures: Page 1, Page 2 and Page 3) and after a couple visits, I've still only just made a dent in it, but have already found several highlights. Back in the day, when Hiro's Yakko-San was in a tight little spot on West Dixie Highway and there was almost always an hour-long wait, they used to make okonomiyaki, an Osaka-style Japanese pancake / omelet type thing, usually topped with seafood and/or bacon, then bedazzled with Kewpie mayo, salty-tangy-sweet okonomi sauce, aonori, pickled ginger, and wispy katsuobushi shavings that wriggle in the heat. It disappeared from Yakko-San's menu some time around their move to a larger space, and is otherwise an elusive dish to find. But they're doing okonomiyaki at Gaijin, and it's a good version, with a hearty, chewy base and a layer of crisp, salty pork belly underneath all those toppings. We only had three nights in London on this last trip, our first visit in a decade, but I think our dinner choices – Rules, St. John, and on our final night, The Clove Club – successfully captured a meaningful cross-section. Each of these places might seem quite different on the surface – the red velvet banquettes and gold-framed portraits of Rules are entirely unlike the abbatoir-like black-and-white starkness of St. John, which is equally unlike the cool modernism of the Clove Club. 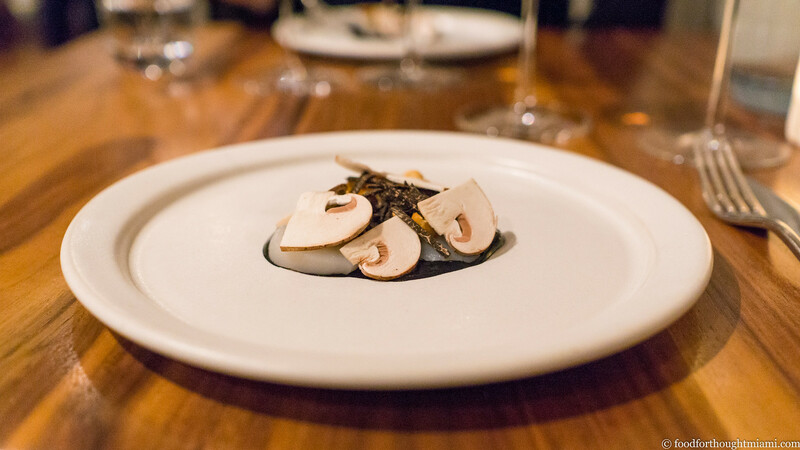 Though the spare, contemporary plates at Clove Club might appear to be from a different world than the straightforward, traditional dishes at Rules, there's a thread which runs through them: a deeply ingrained dedication to British ingredients. 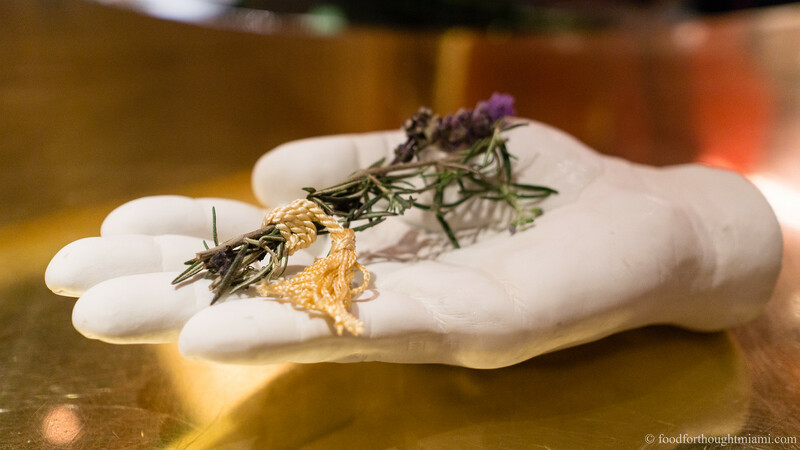 The Clove Club, which started as a living room supper club run by chef Isaac McHale, has made itself a home in a 150-year old building that used to be the Shoreditch Town Hall. 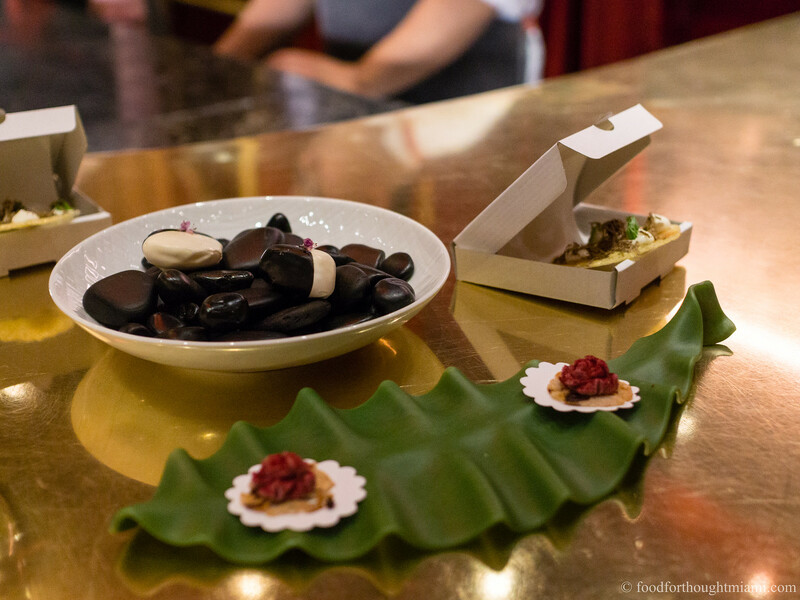 Now, you enter into a smart, cozy bar – where, it should be noted, several smaller dishes from the tasting menu are available on an a la carte basis, something I'll be keeping in mind the next time in town. You pass from the bar into an equally smart dining room, the centerpiece of which is a shiny open kitchen. Sometimes these layouts feel like a stage, where the diners are meant to gaze in rapt wonder upon the chefs. This one feels more like the loft of your tasteful London friend, the one with a fetish for blue subway tile and 1960's Scandinavian furniture. It's elegant, in an understated way; but more important, it's comfortable – it still feels like it could be a living room supper club, though in a pretty fancy living room. Dinner can be either a five-course affair, currently priced at £75, or a more elaborate tasting menu for £110, which was the route we chose. (You can see all my pictures in this The Clove Club - London flickr set; these are from a meal in February 2017). 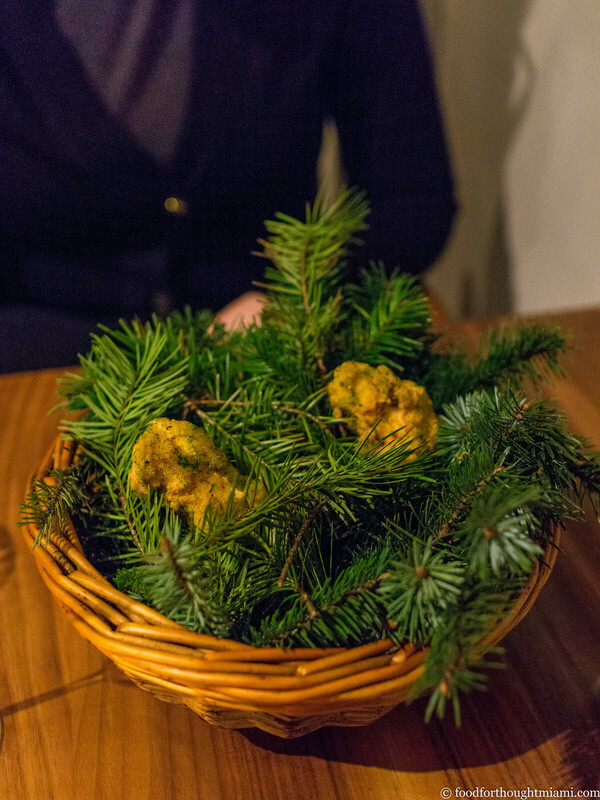 The meal starts with a series of snacks, the first of which is something of a signature dish: buttermilk-marinated fried chicken, dusted with pine salt, and presented nestled in a woven basket filled with pine branches. It is like the platonic ideal of a chicken nugget. A glass of Gusbourne Blanc de Blanc accompanies the snacks, and I'm pleasantly surprised to discover that very respectable sparkling wine is coming from this side of the English Channel, in West Sussex. McHale turns his sights to his native Scotland next with a warm haggis bun, the funk of offal tempered by warm spices and a dusting of vinegar powder. 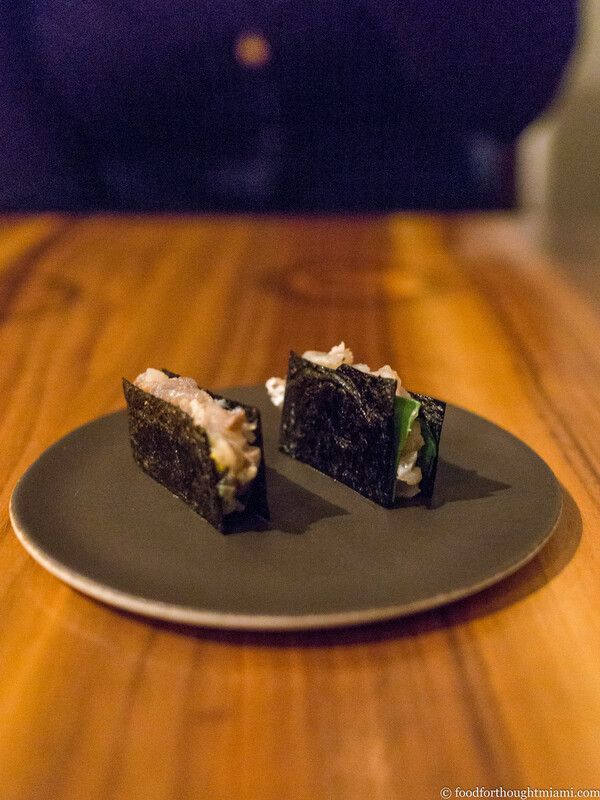 Local ingredients take a Japanese turn with a rectangular laver (seaweed) crisp that serves as the vehicle for a rich, oily mackerel tartare. As much as discussions of immigration policy have dominated the news lately, I'll confess I didn't know until I read this Miami Herald story a few weeks ago that there were several dozen families of Syrian refugees who had been resettled in South Florida over the past couple years. Many have been relocated in areas where there is a bit of a community support network, like Miami Gardens, but others are in isolated areas like Homestead, making a difficult transition, after escaping from the horrors experienced in their homeland, all the more challenging. Some local women have found a unique way to help. Shortly after President Trump signed an executive order implementing his Muslim ban, Kate Cruz was moved to action. Although she was already active in a non-profit (an organization called Project Motherpath that supports childbirth and parenting programs), her work until then had nothing to do with the Syrian refugee crisis. Still, she cold-called a local mosque in Miami Gardens and asked if there was anything she could do. 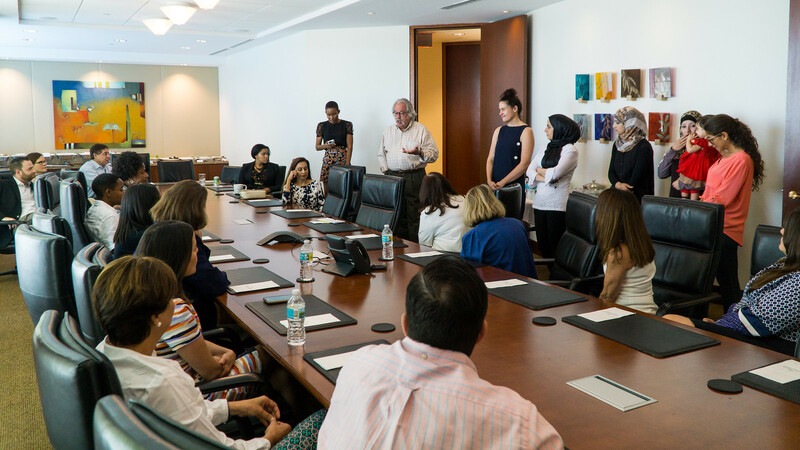 They connected her with the Muslim Women's Organization of South Florida, and together they organized a "South Florida Syrian Supper Club." 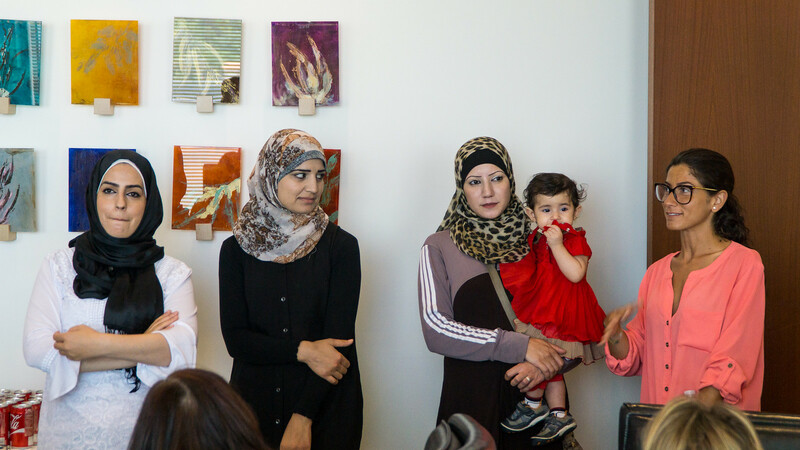 It's a wonderful idea: a rotating group of Syrian women refugees prepare meals of traditional dishes in people's houses, typically for $50 per person, with the proceeds going to support the women and their families. In addition to sharing their food, they also share their stories – of what brought them here and what they've faced since arriving. One of my work colleagues recently hosted a lunch at our office for thirty people, and it was a moving experience. Faten, Raja and Mona – with their children in tow – brought enough food to feed about three times as many people, Krista (herself a Syrian refugee) helped translate for them, Kate, along with Yasemin Saib and Sahar Shaikh of MWO, shared some more stories of what they're faced with and other ways people can help, and everyone ate incredibly well. This would have been worthwhile even if the food was lousy, but it was a pretty incredible feast. 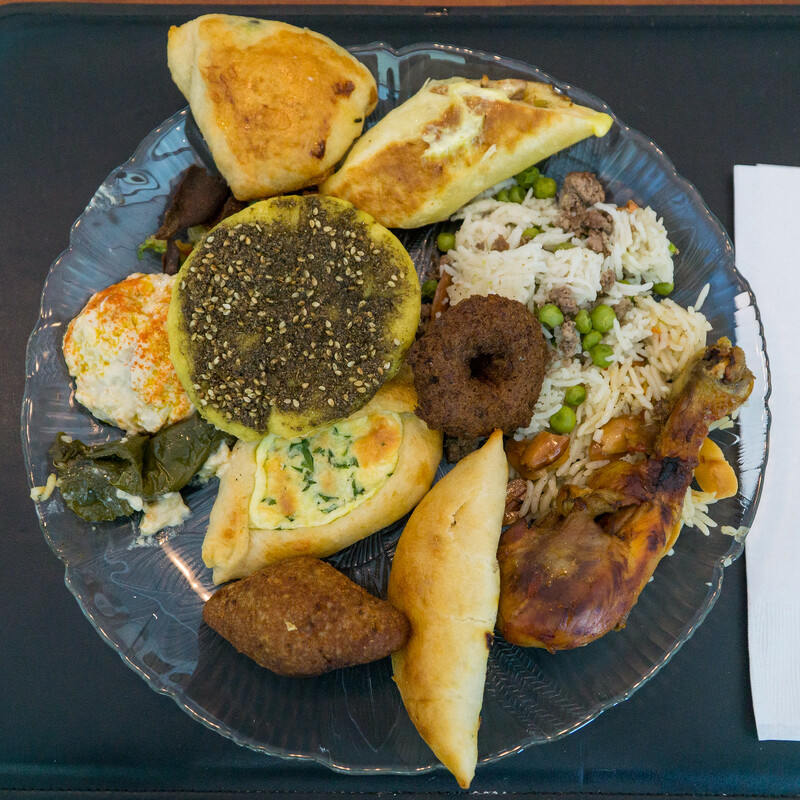 Some of it was familiar – kibbe balls with ground meat encased in a crisp bulgur wheat shell, smoky, creamy baba ganoush, tender grape leaves stuffed with rice, herbaceous tabbouli salad and fattoush salad garnished with toasted pita shards. Other dishes were new to me – chicken legs roasted with warm spices, served over rice studded with whole almonds toasted to a golden brown, an assortment of puffy pies filled with meat, or cheese, or generously dusted with za'atar spice. And still others had familiar names but were still different in their ways: falafel shaped like little doughnuts, chicken shawarma wrapped in thin, almost crepe-like bread, spiked with a tart green pickle and dolloped with a creamy, garlicky sauce. Ken Lyon is something of a grizzled veteran of the Miami dining world, one with a knack for spotting valuable restaurant real estate. He was way ahead of the curve when he opened Lyon Freres, a Franco-philic market and cafe, on Lincoln Road in the early 1990's, well before the tourists thronged and the rents skyrocketed. More than a decade later, he was also one of the early pioneers of the then-sleepy Design District: in 2008, he opened Fratelli Lyon, an Italian restaurant, in the space which is now home to MC Kitchen. His jump into the Design District came not very far behind Michael's Genuine, which just celebrated its tenth anniversary. Though Lyon's been around for a while, his latest project – Charcoal Garden Bar + Grill – is very much on-trend. It's in Wynwood. 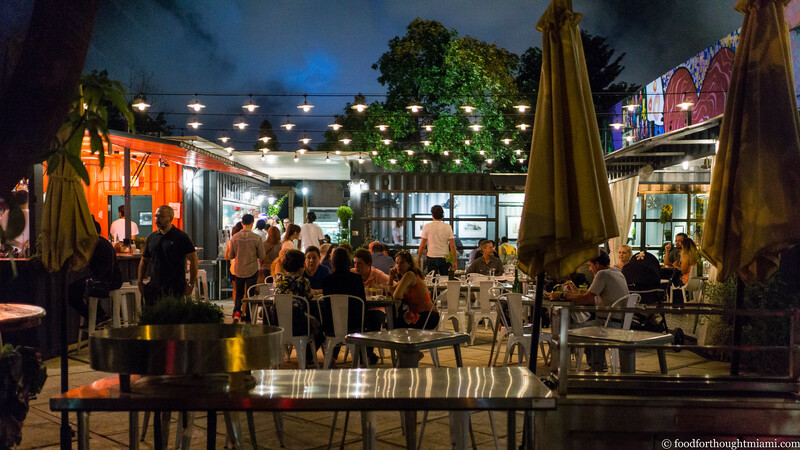 It's built entirely out of semi-portable shipping containers. And everything is cooked using a Josper charcoal grill/oven, the new favorite toy of chefs who like to play with live fire. This time, Lyon may be a bit more of a trend-chaser than trend-setter. 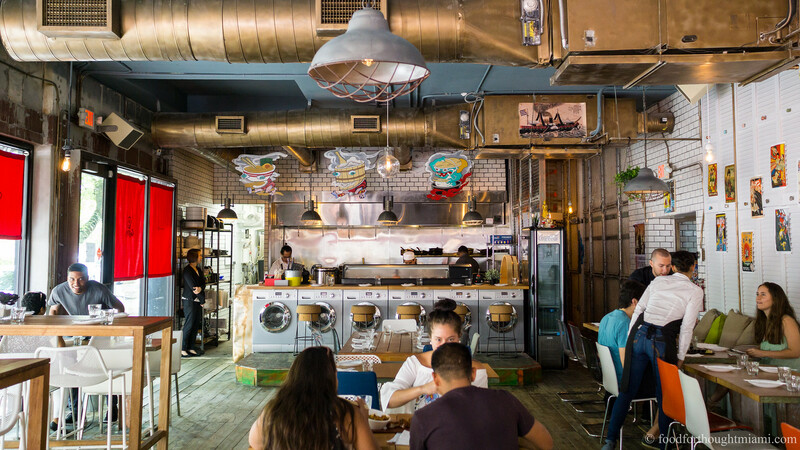 Wynwood has already been one of Miami's hottest restaurant neighborhoods of the past few years, elbowing its way in among South Beach and Brickell. 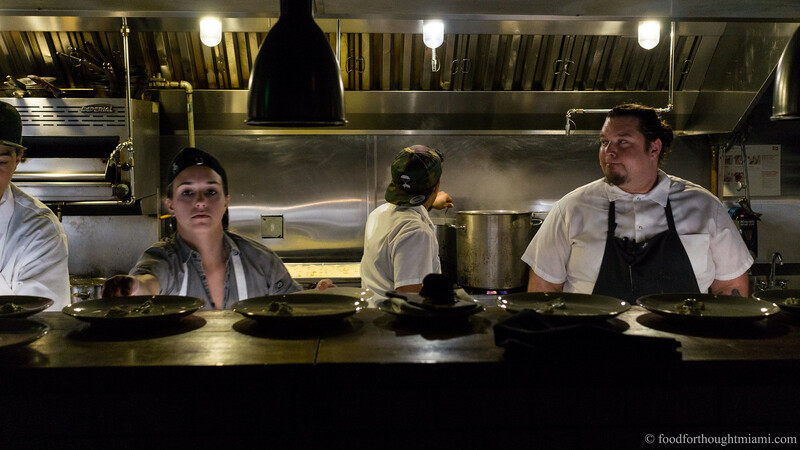 The Josper has already made its way like wildfire (sorry) into Miami kitchens, being the theme of Deme Lomas' new Arson and a touted feature of Klima, Coya and Lightkeepers too. And while Charcoal pitches itself as the first full-service restaurant assembled from shipping containers in the U.S., I think there's at least one already in Washington DC plus a whole Container Park in Las Vegas with multiple restaurants; and of course locally, gastroPod was doing the shipping container thing two years ago, though not as a full-service restaurant. But none of that takes away from something more important: Charcoal's a really nice restaurant. (You can see all my pictures in this Charcoal Garden Bar + Grill flickr set). 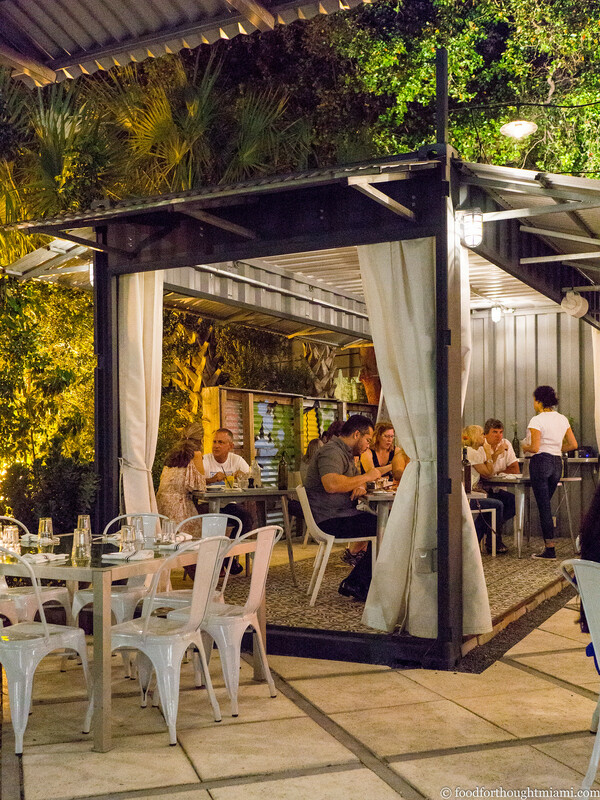 As you enter Charcoal, which occupies a corner of the Wynwood Yard multi-purpose space, a cluster of containers forms a courtyard around an open patio which provides most of the seating. A cut-out container on one side offers some cover when the sun's out, while a double-wide along the back is also air-conditioned. There's a full bar to one side, behind which lies the kitchen. 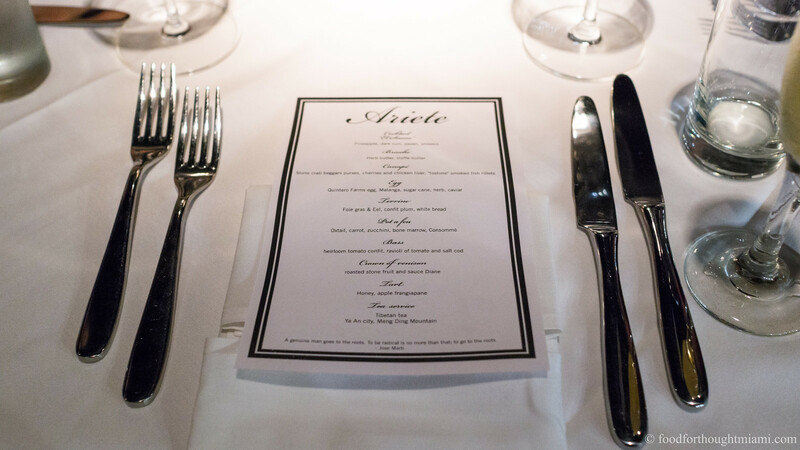 The limited space and equipment of the kitchen gives the menu its focus. 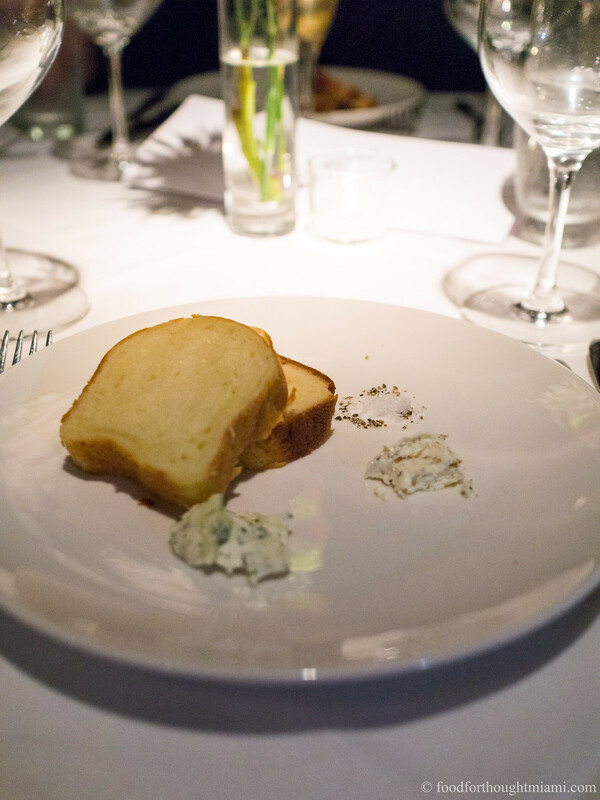 Starters are mostly things which require no cooking: cheeses, charcuterie, smoked fish, raw oysters. For the rest of the meal, an assortment of animals and vegetables are simply grilled or roasted using the Josper. Many of the fish and meats come from Florida waters and farms, including cuts from a whole lamb or pig brought in each week and butchered at their nearby commissary. Some of the vegetables come from an on-site garden, installed by my CSA farmer, Little River Cooperative (though probably not much these days, as the growing season is starting to peter out). You can then combine these with a choice from more than a dozen condiments, listed on a punch card. Ask nicely and you can sample more than one. We started with some of that charcuterie. 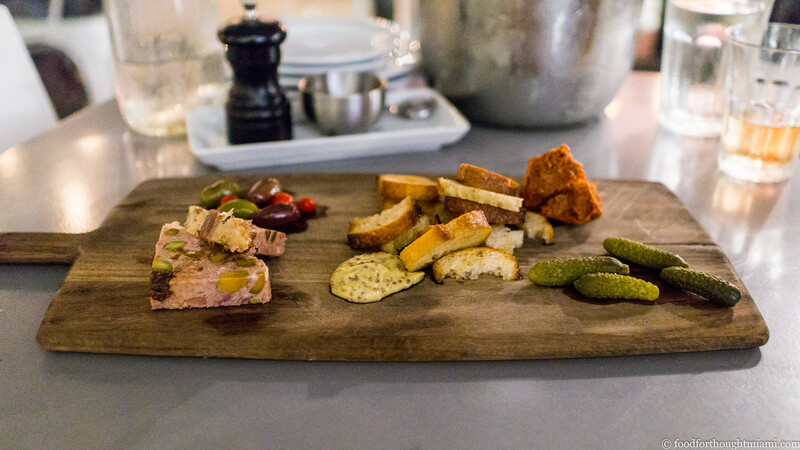 Most of it is bought-in, but one item – a pork and duck liver terrine – is made in-house. And it was very good, richly flavored but not overly heavy, and generously studded with pistachios and prunes. We coupled it with some 'nduja Americana from La Quercia, which makes a great version of the soft, spicy, smoky pork spread. There's also a really nice selection of cheeses, including some personal favorites – Point Reyes Blue, Cypress Grove Humboldt Fog, Vella Jack, Jasper Hill Harbison – which you can either order on their own or, for a small upcharge, add to the house salad which accompanies each main. 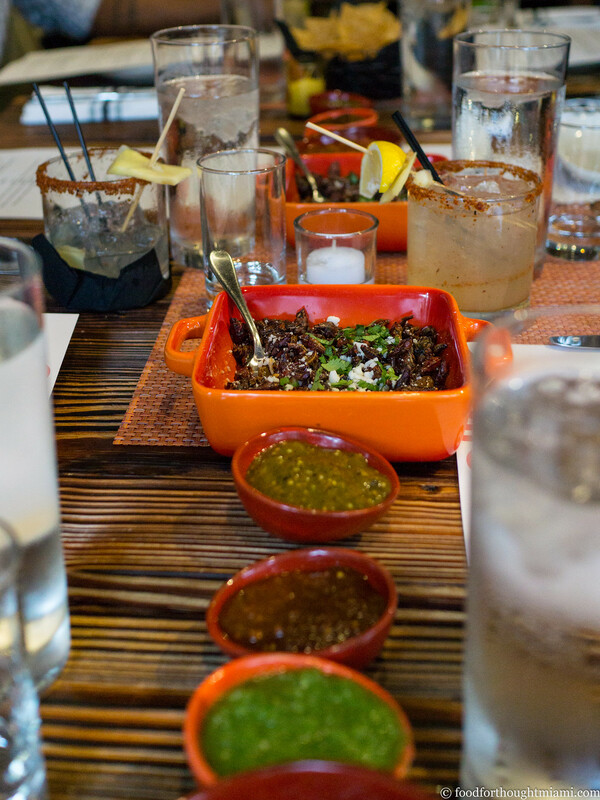 Mexican cuisine is one of several that gets saddled with the "soft bigotry of low expectations." The common perception is that it's all chips and salsa and guacamole, tacos and burritos and fajitas, with maybe some tequila shots, mariachi bands and sombreros mixed in for good measure. 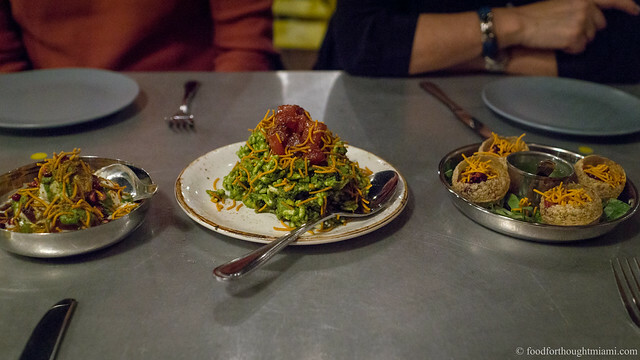 In fact, it's an incredibly complex and varied cuisine, which is finally starting to get the attention it deserves in the U.S.: witness the success of Enrique Olvera's Cosme in New York, or Alex Stupak's Empellon, or places like Taco Maria and Broken Spanish in L.A., or Californios and Cala in San Francisco, or Rick Bayless' restaurant empire, plus new Chicago places like Dos Urban Cantina and Mi Tocaya. I could keep going; but instead, let me bring this back home. Because someone is trying to help Miami catch up. 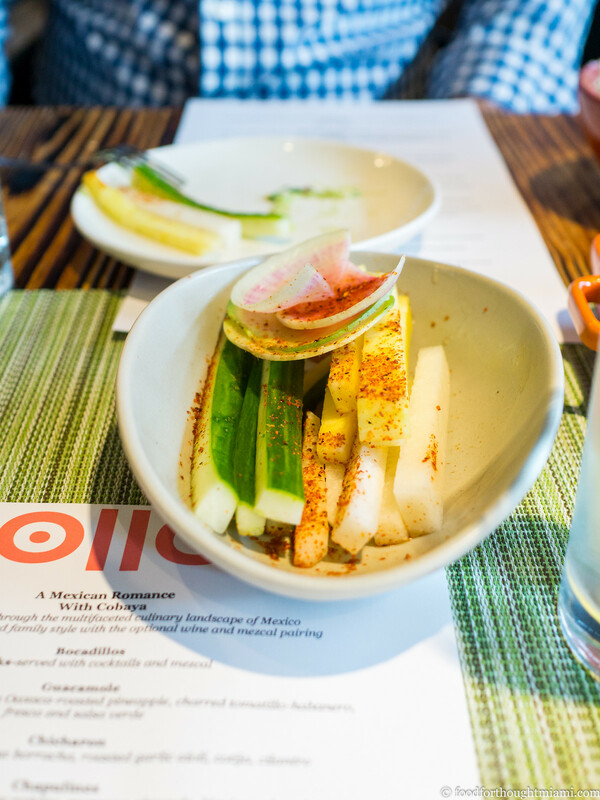 At Olla, Chef Scott Linquist's new restaurant on the west end of Lincoln Road, you'll find a menu that goes well beyond the customary tropes, ambitious both in its pursuit of the authentic flavors of Mexico and in finding modern ways of presenting them. My first visit to was in December, only a week after they'd opened, and I was pretty excited by what I found. Not much later, we started to work on putting together a Cobaya dinner, which came to fruition last week. 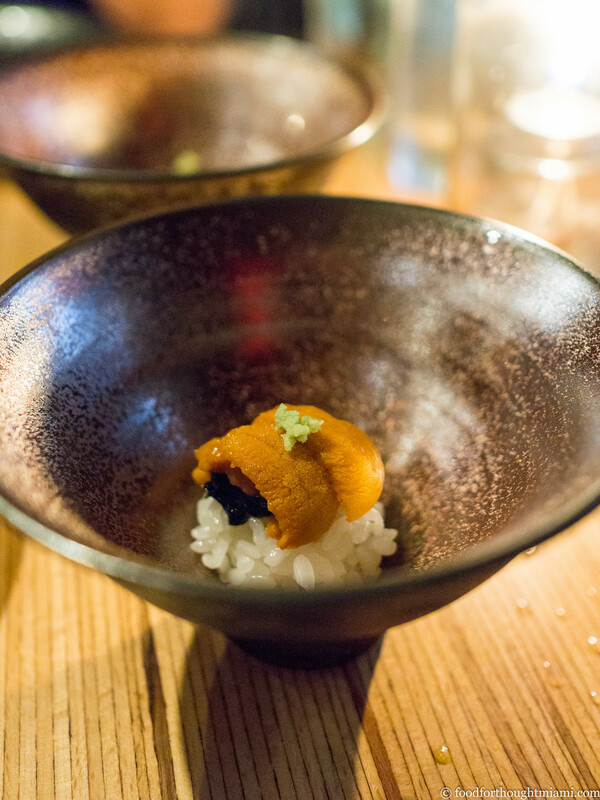 (You can see all my pictures from the dinner in this Cobaya Olla with Chef Scott Linquist flickr set). 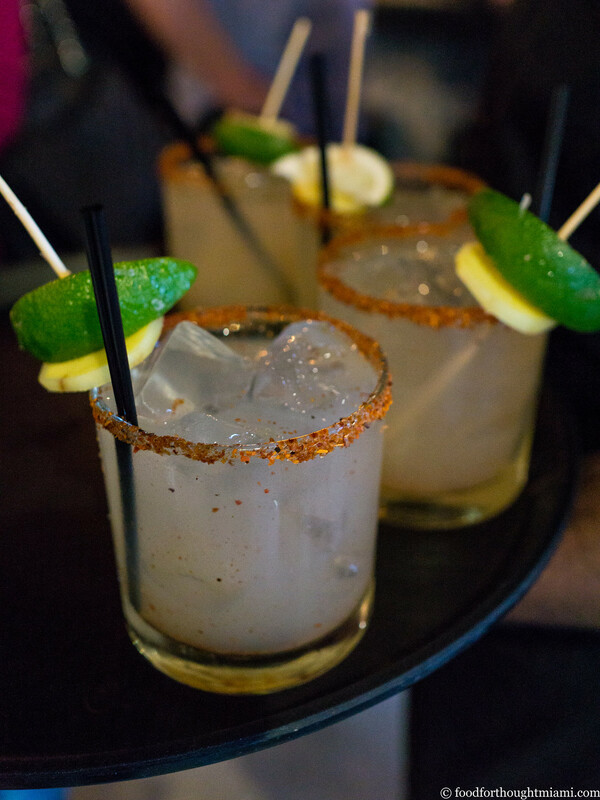 Everyone was welcomed with a house cocktail – a variation on the flavors of a Moscow Mule, which they dubbed the "Oaxacan Burro," featuring Alipus mezcal, a ginger and epazote shrub, a slug of ginger beer and a squeeze of lime. 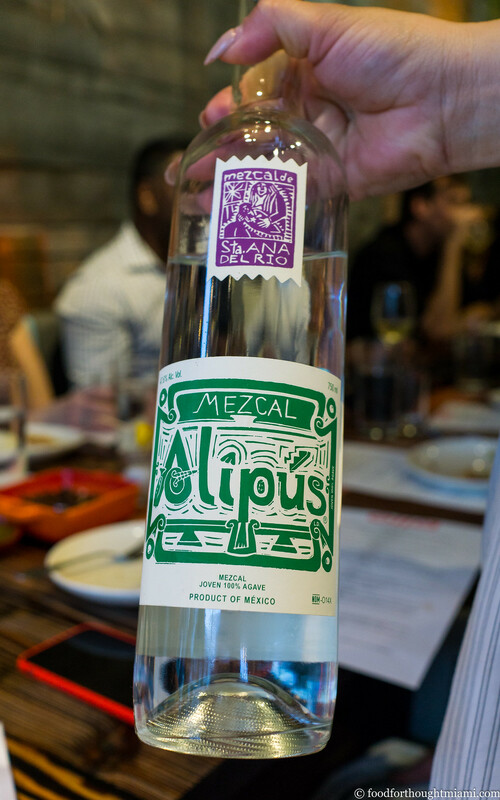 This was prelude to a mezcal sampling courtesy of XXI Wine and Spirits, a distributor for Alipus, which poured three different "single village" offerings. I'm becoming a real fan of mezcal, which is almost exclusively a craft, small-production product, and which can show a fascinating variety of styles and flavors – some with a clean, almost sake-like purity, others floral, or fruity, or grassy, or smoky, or all of the above. Once our group of fifty was seated (we took over the restaurant for the night), dinner started with a round of bocadillos, or snacks. Yes, chips and salsa. But not just any garden variety salsa: four different salsas, starting with a basic salsa fresca, and also including a fresh, raw salsa verde (with some bright, fragrant mint in addition to the usual cilantro), a deeper-flavored, charred tomatillo and habañero salsa verde, and a hearty, red brick hued version with pasilla Oaxaca chiles and roasted pineapple. Plus guacamole, because yes, everyone loves guacamole. 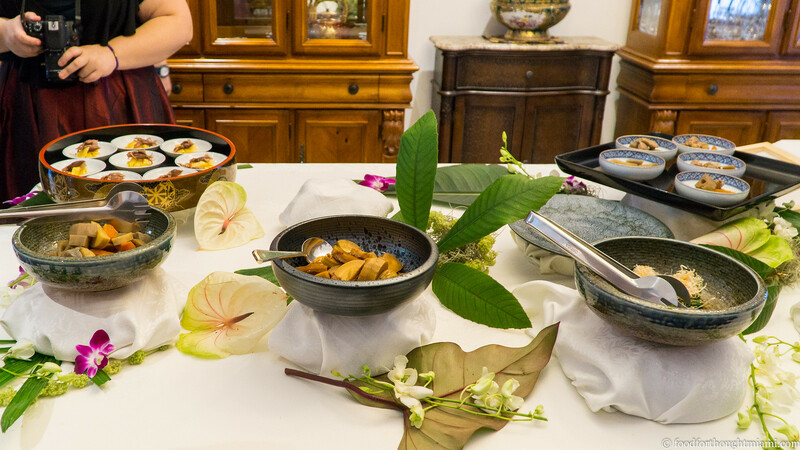 Last month, I had the good fortune to be invited to an event at the Japanese Consulate in Miami, extolling the virtues of washoku, or the traditional cuisine of Japan. 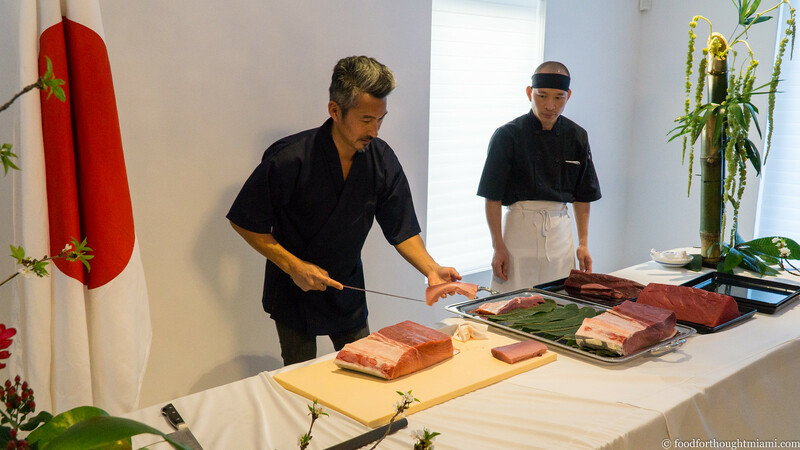 The event was hosted by the gracious consul general, Ken Okaniwa, but the headliner was chef Shuji Hiyakawa, who provided a live-action sushi-making display. I had a feeling we were in good hands when Chef Hiyakawa started with the preparation of the rice, noting how every component is essential to the finished product: the blend of two vinegars he uses to season the rice, the wooden bowl in which it's prepared, which retains the right amount of heat and absorbs the right amount of excess liquid, the manner in which it's mixed, so that all the grains are seasoned, and neither too starchy nor too loose. 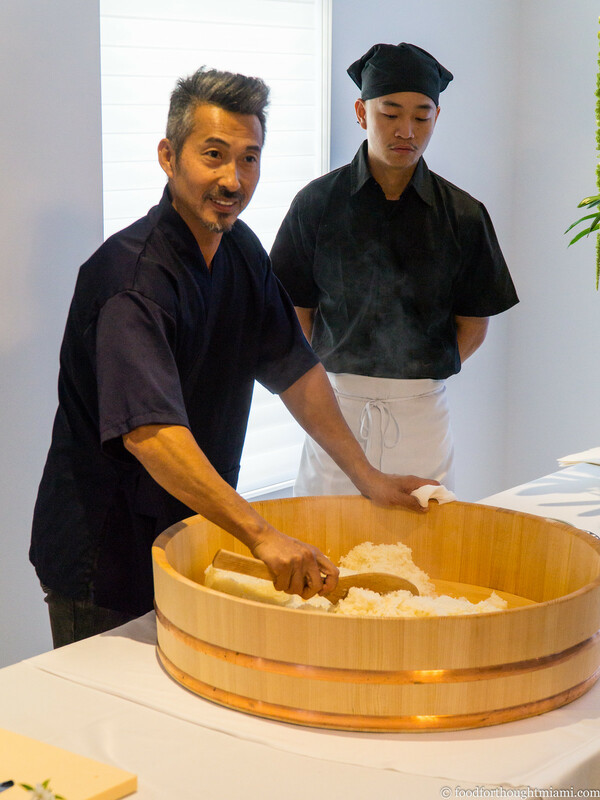 With the rice made, he went on to break down an entire loin of bluefin tuna. Given the depleted state of the species, I really would have preferred to see just about anything else on the cutting board. I suppose between its immense popularity in Japan, and its increasing popularity here in the U.S., and many diners' lack of understanding of the different cuts sourced from the same fish – the fattiest o-toro, the medium-fatty chu-toro, and the lean maguro – I understand why they would choose this for the demo. But particularly given the traditional washoku theme, I would have been grateful for a presentation on the virtues of the many other varieties of fish and seafood that can be made into sushi. After all, the bluefin obsession is actually a relatively recent thing – in Japan, it was mostly thought of as a trash fish until the 1970's (for further reading: "From Cat Food to Sushi Counter: the Strange Rise of the Bluefin Tuna," which is mostly based on Trevor Corson's book, "The Story of Sushi"). Nonetheless, it was an informative demonstration, and even better, was followed by an assortment of prepared dishes, which were accompanied by more than a dozen Japanese sakes, none of which are currently available for distribution in the U.S.
(More pictures from the event in this Culinary Secrets of Traditional Washoku flickr set). 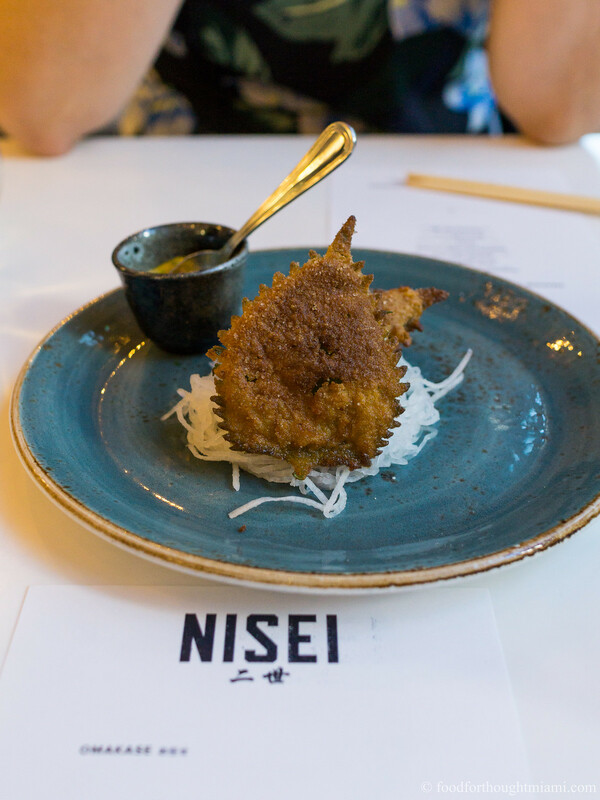 As it turns out, this would not be the only opportunity to try Chef Hiyakawa's handiwork; he was only weeks away from opening his own restaurant in Miami. The chef, who hails from Fukuoka, Japan (where his father had a noodle shop), came to the U.S. to work for Masaharu Morimoto at his flagship Philadelphia restaurant, where he was executive sushi chef for several years. More recently, he wound his way to South Florida, until recently working as executive sushi chef at Kuro in the Hard Rock. He's now running his own place, Dashi, in a space inside the River Yacht Club. (You can see all my pictures in this Dashi - Miami flickr set). While his demo at the Japanese Consulate may have focused on traditional Japanese cuisine, Chef Hiyakawa's restaurant bridges old and new. 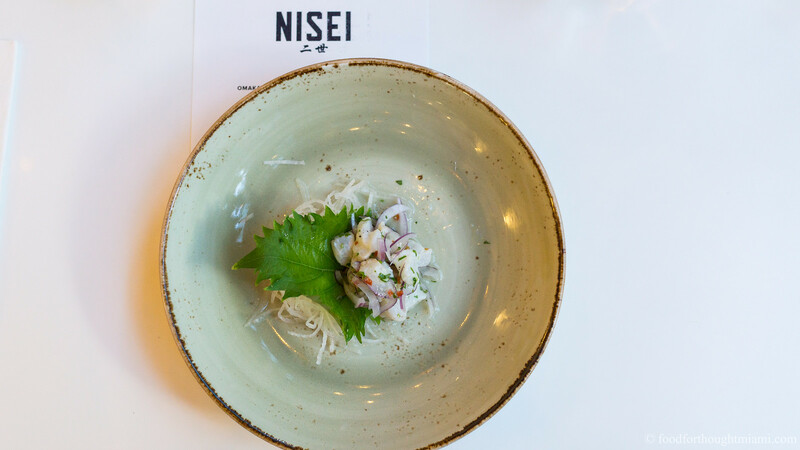 In addition to nearly two dozen sushi and sashimi options, the menu includes prepared dishes that are both traditional (wagyu beef sukiyaki) and contemporary (white fish tiradito with sudachi juice and olive oil). 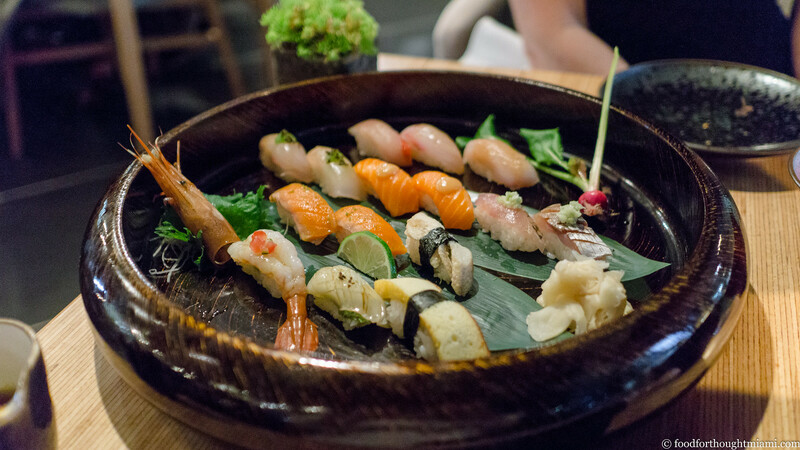 We sampled a couple of these prepared dishes while awaiting our sushi order. 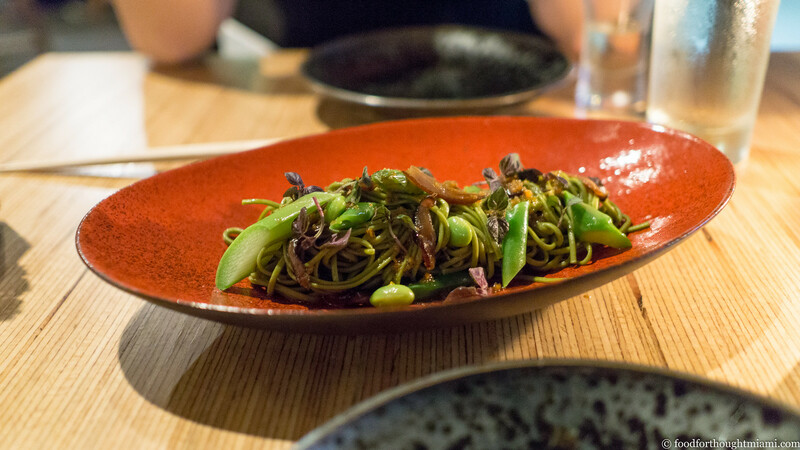 A salad of cha-soba (green tea noodles) was speckled with edamame, batons of asparagus, and slivers of shiitake mushroom steeped in soy sauce, all napped in a lightweight but umami-loaded variation of the restaurant's namesake dashi broth. 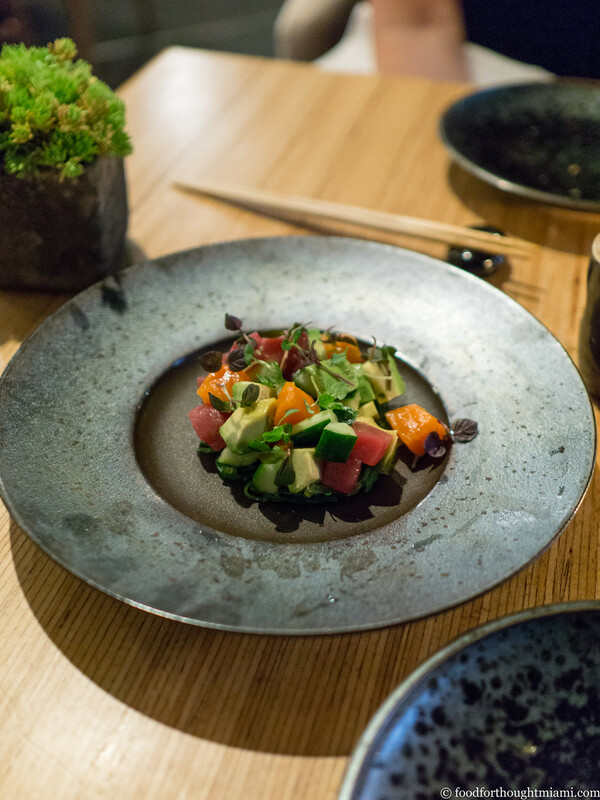 A "House Poke Salad" was a rather un-poke-like but tasty combination of cubed tuna, tomatoes, avocado, cucumbers, and micro-greens in a ginger and miso dressing. It was a pretty sparse plate to bear a $25 price tag. Mrs. F and I ordered an assortment of sushi which was presented all at once (pictured at top). Our order included kinmedai (golden eye snapper), madai (sea bream), hamachi (amberjack a/k/a yellowtail), aji (horse mackerel), shima aji (striped horse mackerel), masu kunsei (smoked sea trout), sake (salmon), botan ebi (sweet shrimp), ika (squid), anago (sea eel) and tamago (omelet). You see? There are a million wonderful things in the sea to eat other than bluefin tuna. There were a few things I really liked about this. First, Dashi's rice is indeed very good: well seasoned but not overwhelmingly so, with each grain distinct on your tongue, neither dry nor overly moist and clumpy. This was all the more impressive given that an order of this size, served all at once, necessarily has to sit for a time as each piece is being assembled (more on that later). Second, each piece was already brushed with nikiri, a glaze usually made of some combination of soy sauce, mirin, dashi and sake. Our server actually discouraged the use of a soy sauce dipping bowl at the table, as each piece had already been properly seasoned. 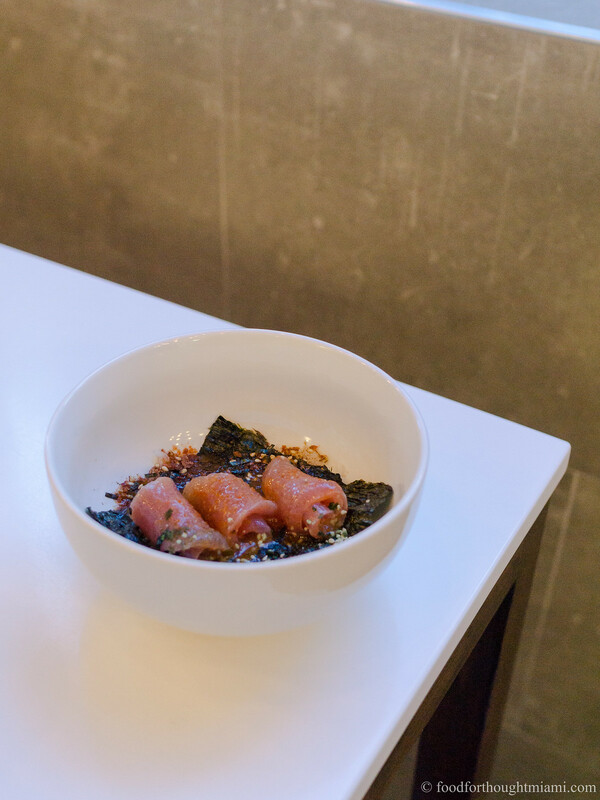 Some also had been given a little extra garnish – a daub of miso on the salmon, freshly grated ginger on the aji, a shiso leaf tucked under the ika and a sprinkle of black salt on top. And finally, the fish – much of which is flown in from Japan, with its particular provenance listed on the menu (hamachi from Kyushu, kinmedai from Chiba, shima aji from Wakayama) – was very good. It's not Naoe level quality, but Dashi is probably close to on par with what I've had at Makoto or Myumi. Prices are steep, even more so than Makoto, which ain't cheap: other than the tamago on the low end and Hokkaido uni on the high end, our order ran between $7-10 per piece, compared to mostly $5-7 per piece at Makoto. They have a nice selection of sakes and Japanese beers to accompany your dinner, as well as some Japanese inspired cocktails. 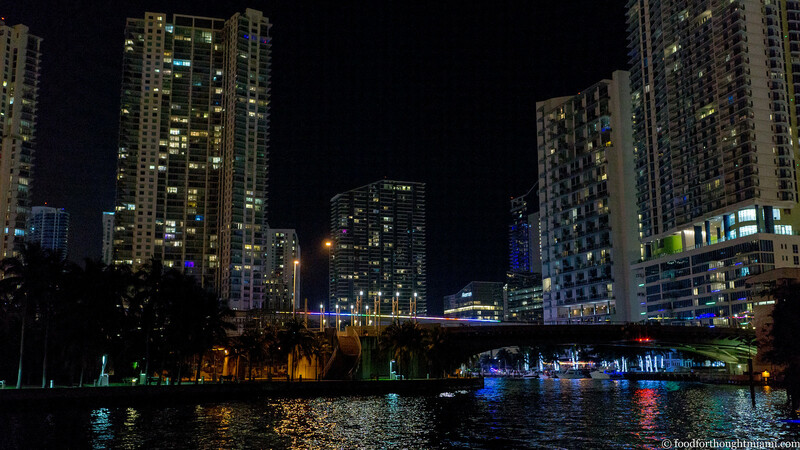 Dashi's location, as a sort of restaurant-inside-a-restaurant within the River Yacht Club, is itself a draw, with a vista that looks across the Miami River in one direction towards downtown and in the other towards Brickell, including the recently re-lit "Miami Line" designed by artist Rockne Krebs which stretches along the Metrorail bridge. Unfortunately, there is one glaring omission from the design of the restaurant, which otherwise is a pretty slick and scenic indoor-outdoor space: there's no sushi bar. And not to sound like a prima donna, but this is very nearly a deal-breaker for me. If you want good sushi, there's simply no substitute for being right at the counter, with each piece passed across to you as it's made. The rice can be packed looser, the neta doesn't sit and dry out as other pieces are made; it's just impossible to duplicate that when you're making a dozen pieces at a time which sit for several minutes before they get to the table. 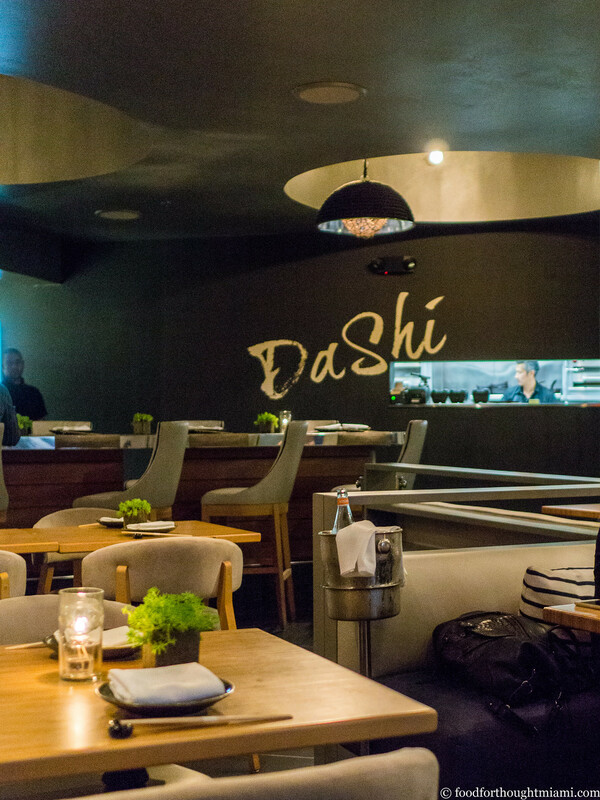 But the combination of good food and a waterfront view is surprisingly elusive in Miami; it's a combination Dashi achieves, if you're willing to take the view as a trade-off for the absence of a sushi bar, and pay a premium for it. This is an intriguing piece of property, situated on the Brickell side of the Miami River nearly underneath I-95 and next to Jose Marti Park.The main restaurant there apparently has a "rotating chefs-in-residence" program, though what I mostly noticed while walking through to Dashi was the "untz untz" music and what appeared to be a session of Advanced White People Dancing Badly on the outdoor dance floor. Of course, the converse isn't necessarily true either: everything can get screwed up even when you're right at the sushi bar. A few weeks ago I visited another recently opened Miami sushi den, which had a beautiful 8-seat sushi counter manned by five hard-working sushi chefs. It also had one of the most interesting and exotic selections of fish that I've seen offered in Miami. Unfortunately, the rice was so bad – dry, under-seasoned, stiff – and much of the fish was also so dried out and consequently lacking flavor, that I'm reluctant to even give the place a second try. It's a shame, because it was an ambitious and exciting assortment that otherwise would be right in my sweet spot.